The four Gospels are filled with demands from Jesus. 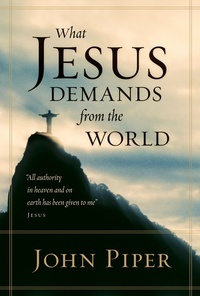 These demands are Jesus’ way of showing us who he is and what he expects of us. They are not harsh demands originating from a selfish desire to control, but rather loving directions for our good and ultimate satisfaction. In fact, what Jesus demands from the world can be summed up as: “Trust and treasure me above all.” This is good news! In What Jesus Demands from the World, John Piper looks at the demands of Jesus as found in the four Gospels. He begins with an introduction that puts the demands in a redemptive-historical context, then engages in a concise examination of each. The result is an accessible introduction for thoughtful inquirers and new believers, as well as a refreshing reminder for more mature believers of God’s plan for his Son’s glory and our good.